This was the main course for this weekend’s seafood-focused dinner. It takes some time, but almost everything can be done in advance, making it easy to prepare for guests. The lobster-cream sauce for the orzo was fantastic, and it should go without saying that butter-poached lobster isn’t going to be too bad. 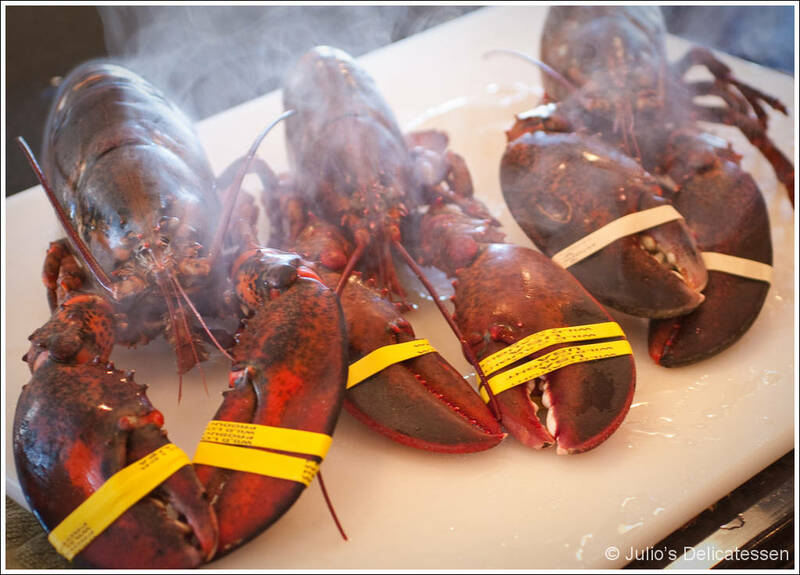 Partially cook the lobsters – Add enough water to a large empty pot or coleman cooler (4 quarts per lobster should be about right) to cover the lobsters. Boil the water, then add the vinegar. 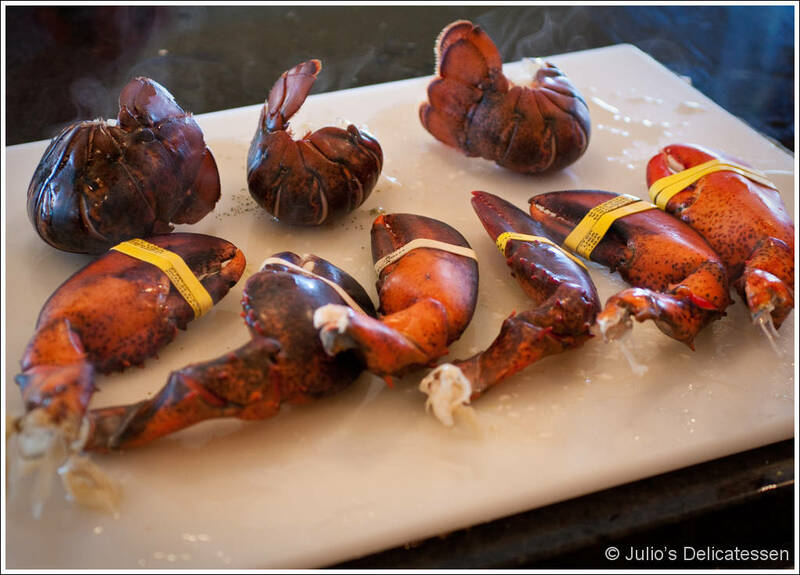 Turn off the heat and add the lobsters to the pot (or, if using a cooler, pour the water over the lobsters and cover). Allow to steep for 2 minutes (for 1.5 lb lobsters) or 3 minutes (for 2 lb lobsters). 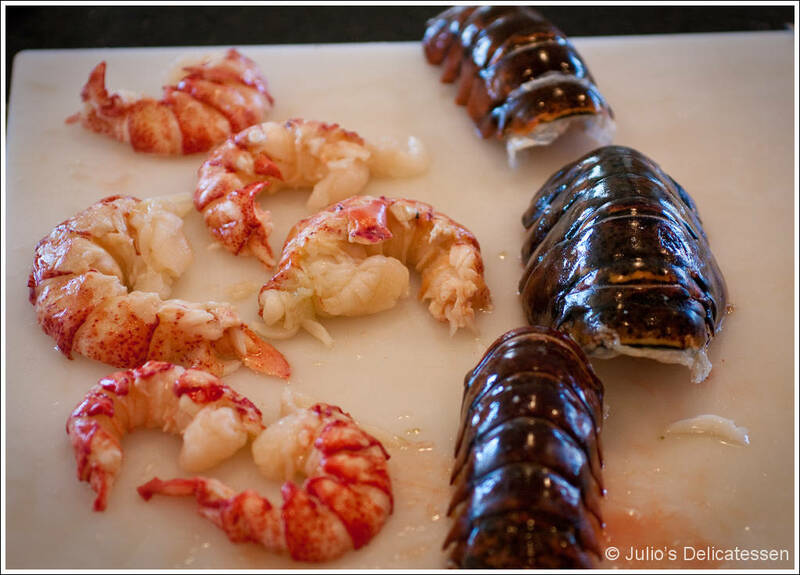 Remove the lobsters from the water-vinegar mixture. Using gloves or a towel, twist the tail in one direction to remove from the body. Twist the arms (claws and knuckles) from the body and return them to the pot for another 5 minutes, after which you remove them from the water. Remove the meat from the shells – to remove the tail meat, twist the tail fan in one direction to remove, then use your fingers to push the meat out of the shell. Cut the tail meat in half lengthwise and remove the large vein. and pull the small pincer down until it is very loose. Move it back and forth horizontally until it separates. Crack the shell and attempt to remove claw meat in one piece. Discard any cartilage. Use scissors to make a cut in each knuckle shell and remove the meat. Place all of the meat on a paper-towel-lined plate and cover tightly with plastic. Refrigerate until ready to use. Rinse the shells to use for the orzo. 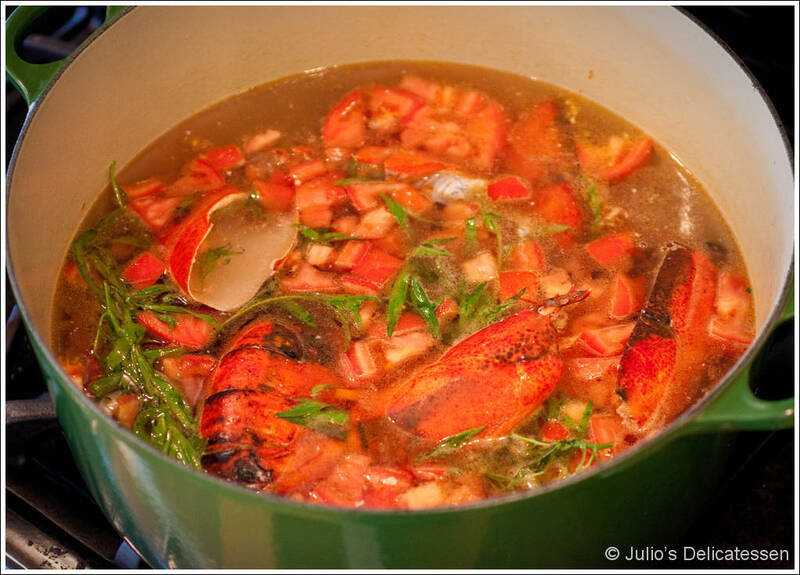 Make lobster stock for the orzo – Heat some canola oil over medium-high heat. Sear the lobster shells, working in batches, until they turn red. Add the tomatoes, tarragon, and carrots plus enough water to cover everything. Bring to a boil, then reduce to a simmer. 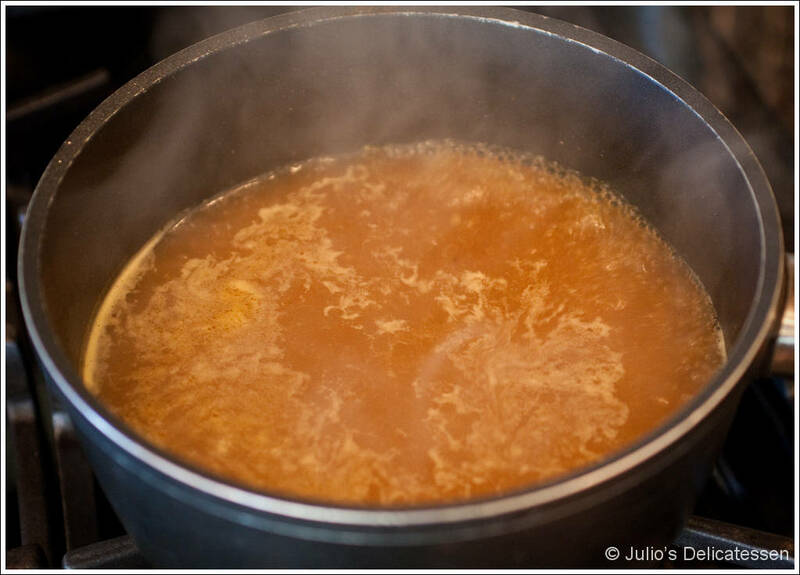 Simmer for one hour, skimming off any foam. Strain the stock through a fine mesh strainer. 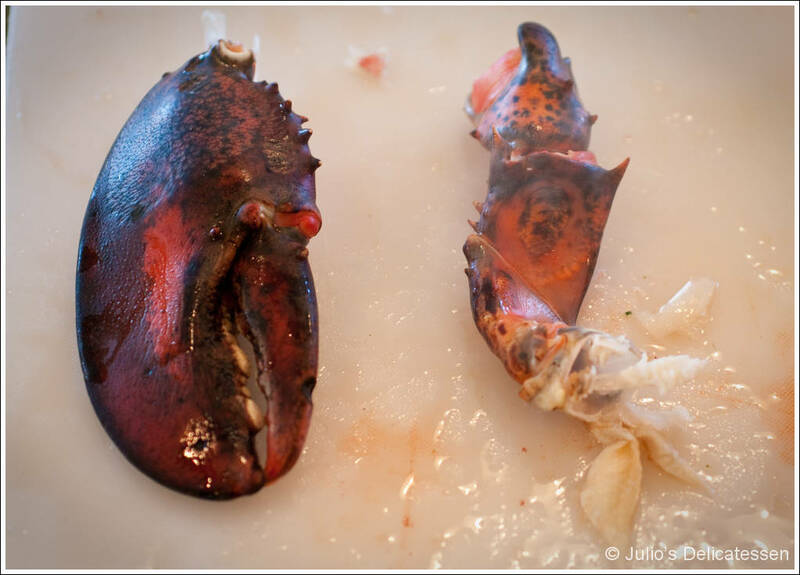 Discard the lobster shells and vegetables. Return the liquid to the pot and simmer until only one cup remains. Add the heavy cream and simmer until reduced to the consistency of a sauce. Strain into a container and refrigerate until ready to use – up to 2 or 3 days. Make the orzo – Bring a pot of salted water to a boil and cook orzo just until tender. Strain and rinse under cold water. Add to the lobster stock/cream mixture. Place the orzo and sauce into a small saucepan and keep warm. Butter-poach the lobster – Remove the lobster meat from the fridge and allow to come to room temperature for several minutes. In a saucepan, heat 2 Tb of water to a boil. Add a couple of chunks of the butter. Whisk to form an emulsion. Reduce heat to low and continue whisking in butter one chunk at a time. Add the lobster and cook for 5 or 6 minutes. While the lobster is cooking, whisk 2 Tb mascarpone cheese into the orzo. Season with salt. Spoon some of the orzo onto each of 6 plates. 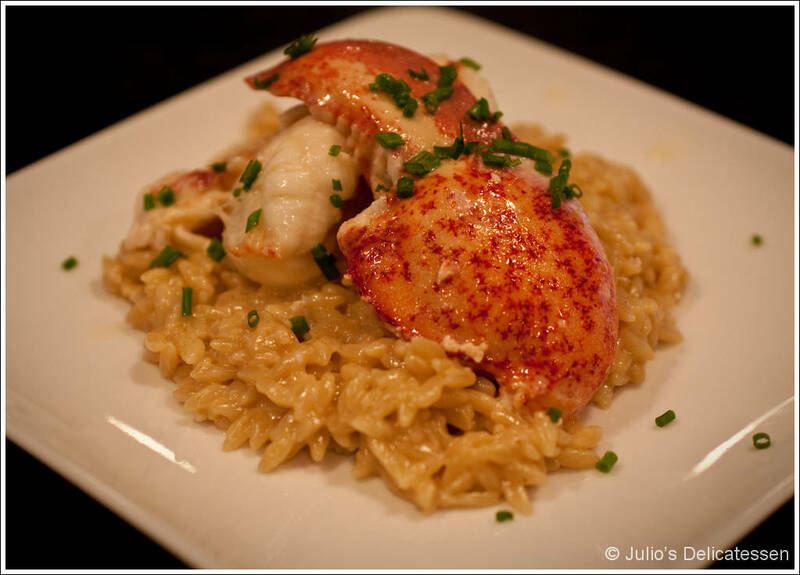 When the lobster is done, place meat on top of orzo and garnish with chives. Serve immediately. The fragrance alone would be worth the price of admission. Far too good for the likes of me. You had me at mascarpone….I attend church with your dad and sing in the Singing Church Ladies. My 9 year old daughter has a passion for cooking and wants to be a chef. We love looking at all your creations…..truly beautiful and I’m sure delicious as well. Thanks for sharing your gift! Thanks Janell! Dad and Lucy have told us about you guys and your daughter (who I understand now adds the word “executive” to her future job title). I hope to meet you guys sometime.